It's been an awfully long time coming but after two years of back and forth, the City of London has approved a new strategy for the area around Bank junction. Bank is the meeting point of six major roads. In the mornings it is rammed with people caged into cattle pens trying to cross the road. It is a traffic-choked, polluted mess and it is a hotspot for collisions - most of which involve cyclist or pedestrian victims. 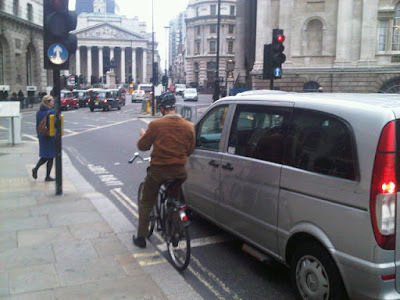 It is difficult to easily cycle through the junction and yet - being at the hub of the Square Mile - it's very difficult to avoid it. In the morning peak hours, 33% of all road traffic through Bank consists of people on bikes. 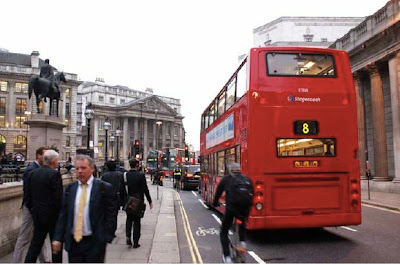 In the City's own words: "Bank junction has one of the poorest road safety records in the City, particularly in relation to injuries to pedestrians and cyclists and the junction does not work well for any mode of transport." The Bank area strategy sets the plan for the next five to 10 years. The City first consulted the public about its plans for the area in 2011 and a whopping 900 people took part (and huge thanks to those of you that did so) Four key themes emerged: too much traffic congestion; inadequate provision for pedestrians; not enough provision for cycling and conflict between the different users. Cheapside consists of people on bikes. In its first draft of the Bank strategy, the City of London planned to make Bank work better and more safely for "all road users". It was a sort of wishy-washy strategy that implied nothing much would really change here and that the place would continue to be dominated by and designed for [the minority of] people in motor vehicles. In this first draft, the City genuinely managed to ignore the fact that a significant proportion of respondents think 'there is too much traffic' at Bank junction and simply proposed a do nothing solution to the problem. I'm delighted to see that the revised strategy that has now been approved is of vastly superior quality. It is honest about the challenges faced at Bank and clear about how it might tackle them. The new plan considers whether it might be possible to do something quite 'radical' at Bank by closing one of the roads: "the project is likely to require the closure of at least one of the arms of the junction in order to reduce the amount of vehicles flowing through...[in order that] capacity could then be redistributed among other users". In other words, the City of London is considering giving proper equality to the vast majority of people who use this junction on foot - and hopefully on bikes as well, rather than in, say, vans or taxis. This could involve diverting some bus routes to make other routes function better for people on foot or bikes. The same approach is being trialled in Hackney, where TfL and the council are planning to divert buses on Mare Street which has the benefit of creating space for walking and cycling. The initial proposal included plans to widen the pavements on Lombard Street, for example. This would likely have eliminated the contraflow cycle lane on Lombard Street. The problem here was a) very narrow pavements and b) bikes perceived to be going too fast on this very busy bike route. This was causing a perception that there was conflict between pedestrians and cyclists on this street. Whereas in reality, the actual problem is that there are too many motor vehicles - in particular delivery vans parked in the cycle lanes. Instead of making the road more intimidating to cycle on by narrowing the carriageway, the City has sensibly recognised the need to prioritise this route as a "predominantly safe cycling and walking route", possibly by means of shared space such as the City has implemented with success in some other areas. This may mean making Lombard Street less accessible for through motor traffic; it should make things better for pedestrians by giving them more space and it should ensure that the route remains a useful and safe link for people on bikes - without forcing bikes into narrow carriageways stuffed with idling vans and taxis. The City has clearly listened to the number of people who responded to the consultation and objected to its policy of creating dangerously narrow carriageways and now states: "cyclists do not want narrower carriageways ...as they feel this would impact on their safety". This is true up to a point. As I argued a few months ago, the issue of carriageway narrowing is one of proportions. In streets like Cheapside, the carriageway has been narrowed so much that it is now a considerably nastier place to cycle (even though the scheme was originally intended to make it better for cycling). In other streets, such as Kingsland High Street in Dalston, the pavements have been made wider but it works because there is enough room for bikes and passes to safely pass each other. That would not have been the case in the original plans for Bank area. The strategy has also been updated in one other crucial area. The original draft included a commitment to "reduce conflict and improve road safety for all modes of transport". Nothing wrong with that, you might say. The reality, though, is that cyclists and pedestrians are bearing the brunt of the problems at Bank and form the vast majority of victims of road traffic collisions here and the there is a clear need to improve road safety here for pedestrians and cyclists more than there is for 'all road users'. As the City now admits, the junction is "over-complicated, confusing and dangerous and dominated by vehicular traffic at the expense of pedestrians and cyclists". The City authorities have now updated their commitment to road safety to include a specific commitment to "including cycling provision and safety and to review the current hierarchy of cycle routes, and provision of cycle lanes"
Many people who read this blog took part in the Bank area consultation and wrote to City of London politicians. My own view is that this revised strategy works well. It rightly acknowledges the need to make conditions much better for people on foot. And it also now acknowledges the need to improve conditions for [often exactly the same] people on bikes. It concludes: "There is clear evidence that the pedestrian environment needs improving but this will not be undertaken at the sake of cyclists or vulnerable road users safety". I agree with that. Well, it is great news to hear that the City is starting to address the needs of the non-motorised within its boundaries but it is not before time. Every day some 350,000 people arrive in the City to work, and only about 4% of those arrive in a private car or taxi, the rest arriving by bicycle or on foot or on public transport – which in effect means on foot as they make the final leg from tube/bus stop to their offices as pedestrians. The number of daily visitors is anticipated to reach 420,000 and it is a sure bet that the percentage arriving in a car/taxi will further decline. No doubt there has been a paradigm shift in cyclist and pedestrian campaigning, with the City now listening to the inclusive brand of campaigner, instead of the exclusive – the make-it-viable-for-my-granny instead of the right-to-the-road group. Has they started that sooner, perhaps we would not have ended up with the disaster that is Cheapside. The mood music at City Hall has changed too, even if Ozzie Osborne is waving a machete around in the vicinity of the budget for the Mayor’s Cycling Vision. (I tend to the view that Boris was not naïve there, rather playing a game of Truth-or-dare with Parliament St). However I suspect that major city institutions are playing their part too. I am not sure that they are necessarily velo-visionaries, but as a human resources issue they do care about street environment and the welfare of their employees who mainly get around on foot. Take for example the situation at Stonecutter Street, closed to motor traffic – and necessitating revisions to routes for some buses which passed through here – at the request, and at the quite considerable expense (£160k) of Goldman Sachs. They urged this despite the fact that it would impact on the ease of exit for taxis picking up their own staff from the rank in St Bride St, because the Stonecutter rat-run represented a real hazard to people out on the street, of whom a significant proportion would have been Goldmans employees. The nature of the City is such that, rightly or wrongly, its resident businesses will always have disproportionate influence, mainly at the corporate level but also through the allocation of votes to each business according to their numbers of staff in each address. One shouldn’t pretend that the interests of Megabank Plc or Magic Circle Solicitors LLP will precisely align with cycling and pedestrian interests, but the alignment is closer than some might think and should be exploited. While all efforts to improve the safety of cyclists and pedestrians are of course to be applauded - no-brainers basically - I feel that some attention should be paid to the law of unintended consequences. Might it not turn out, for instance, that closing one arm of the junctions could actually increase the speed of the remaining traffic? Coupled with the information overload faced by drivers - signs, lane markers etc - we could end up with conditions just as dangerous for two-wheelers, but now moving faster? Surely the Bank black hole is almost always going to be problematic in any model, other than the New York Times Square-style complete vehicle ban. Opening the Lothbury/Throgmorton St to 2-way cycling would represent a significant bypass, however. Next up, the other end of King William St? Great news! Clean and good bypass I want to use this road to see more...lombard ohare At Lombard Taxi, we're proud of our staff. More importantly, we're proud of how they treat other people. They always go above and beyond to make sure that you are comfortable with your service. Whether it's going from point A to point B or handling the last minute time frame or multiple destinations, we are ready to see it through. We provide high-quality service at a low price. We are always open, twenty-four hours a day and seven days a week. Our transportation service features traditional and large (mini-van) vehicles to take you to your desired destination for a low, affordable rate.